Even though it’s not quite finished, I wanted to introduce the new Rhythm Game. Two reasons for the early introduction. Illicit feedback as it is developed as well as find bugs earlier in development. Even though it’s not done, it already is useful and should benefit students! Support for microphone input (I’ve done the initial testing on this and so far so good). Is there anything I missed? If you have a suggestion on features or a bug to report please do so in the comments below. Thanks! This entry was posted on Tuesday, February 15th, 2011 at 9:37 pm	and is filed under News. You can follow any responses to this entry through the RSS 2.0 feed. You can leave a response, or trackback from your own site. Added replay and new game controls today! Added 3 levels of complexity: Simple, Moderate, and Maximum Complexity. 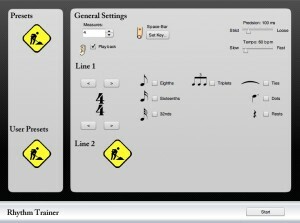 Added time signature to beginning of each line and visual metronome.